FORS standard version 5 is here! This is my simple yet comprehensive guide to the main changes, all in one place. The new FORS Standard VS5 is the fifth iteration and sets out the requirements operators must meet if they wish to become FORS accredited. The revised edition addresses the need for air quality improvements and sets out requirements to help operators mitigate against threats of terrorism. Provision is also made for a broader range of operations and vehicles, including powered two-wheelers, and new requirements for bus and coach operators. The FORS Standard is updated every two years to reflect the continuous evolution of best practice and FORS’s aim to drive-up safety, environmental, and efficiency standards for all road transport operations. Version 5 highlights the increasing diversity of commercial fleets and aims to make it more accessible for a broader range of vehicles to achieve accreditation. It contains a more robust commitment to raising environmental standards in operations, recognising the need for better air quality in UK cities via revised requirements and a revised training programme. The main changes make FORS more accessible to more vehicles, especially growing fleets of motorcycles and other powered two-wheelers, which contribute to many deliveries on UK roads. Specific load safety requirements set out by vehicle type are included, not only for heavy goods vehicles, vans and passenger carrying vehicles (PCVs), but also powered two-wheelers as well. PCVs are also given greater credence, with a new requirement at FORS Bronze to ensure accessibility, comfort and safety for all passengers. The requirement must be demonstrated via a passenger safety policy, on vehicle signage and adequate access for all passengers. A new counter terrorism requirement has been introduced, meaning operators must have a policy and supporting procedures in place at FORS Bronze, which names a Counter Terrorism Champion. Under new Bronze training requirements members must also have completed the current FORS Professional Security and Counter Terrorism eLearning module within the 24 months prior to audit. An added emphasis on improving environmental operating standards becomes evident with a new requirement at FORS Silver for HGV and van drivers to complete the FORS Professional ‘LoCITY – Time to clean up’ eLearning module within the 24 months prior to accreditation. In line with the progressive nature of the scheme, FORS has also introduced a requirement at Gold for drivers to have completed either the FORS Professional LoCITY Driving training course, or a FORS Approved environmental awareness course within the past five years. This is in addition to the current requirement to have attended a Safe Urban Driving (SUD), a Van Smart (VS) or a FORS Approved work-related road safety training course, within the five years prior to accreditation. FORS Silver also includes a commitment to tackle noise pollution – a criteria formally only mandated at FORS Gold. Operators seeking FORS Silver accreditation must complete noise assessments at operating centres and noise sensitive locations in a bid to minimise noise pollution and its impact on local communities. The new FORS Standard aims to minimise the probability and severity of collisions involving vulnerable road users. FORS Silver accreditation is also fully aligned to meet both the TfL requirements on managing work-related road risk (WRRR) and the new CLOCS Standard v3, due to come into force in January 2019. Cycle Safety, Van Smart, Smart Driving and Bridge Smart (due to launch soon). These are valid for 12 months and must be renewed every year. After 14 January 2019, Security and Counter Terrorism will no longer be part of the suite of safety eLearning modules. It has become a separate mandatory eLearning module under Bronze D4 and must be undertaken within the past 24 months. Have a look at all the summary of changes in annex 5 below. The FORS Standard version 5 is now available to download on the FORS website here and becomes effective from Monday 14 January 2019 for both new and existing operators. TMconsultant provide a complete FORS Help package providing you with all the requisite document templates and support required to pass your initial bronze audit. If you need advice regarding FORS please do just get in touch. Here to share the knowledge! Congratulations are in order as the FORS Practitioner is awarded to our founder! Nick’s efforts and dedication in achieving this milestone is certainly worth the recognition, as it enhances his personal development and ours and Link2London’s status within the transport and FORS community. 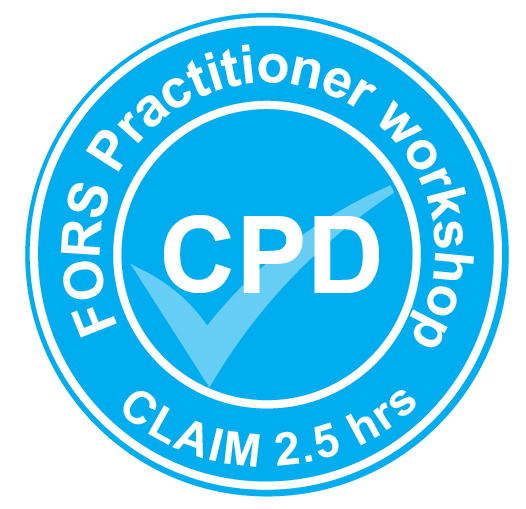 After attending all FORS workshops, Nick has successfully completed the FORS Practitioner programme. TMconsultant offer a pre audit FORS help service. For more information on how we can help you pass your FORS bronze accreditation, just click here! The FORS audit experience, how was yours? Well, the FORS audit experience doesn’t have to be painful in anyway and you should expect to have an informative and pleasurable meeting with your FORS auditor. That said, this isn’t always the case. In my experience of FORS audits, (and I have been to a quite a few) I would say that it is possible you may encounter the odd auditor who can make you feel somewhat uncomfortable. Now we can all agree there is always room for improvement but getting unwanted advice and obnoxious and dismissive comments isn’t necessarily what you signed up for. As far as I’m aware the general ethos of FORS (or more specifically Fleet Source) is to employ knowledgeable auditors who also posses good people and good customer service skills. In most cases that is the case. In fact, I have had the pleasure of meeting many FORS auditors whom are extremely talented transport consultants in their right and are really engaging people. However, if you have finished your audit exhausted with frustration, then how come a few have slipped through the net? I can’t comment for Fleet Source or FORS but one can assume, as with all employers that finding the right people for the job can be difficult. I can speak from experience as I have made some not so great employment decisions. You meet the candidate, interview goes well, good CV etc. But after a few weeks it turns out they aren’t quite who they say they are, and that perhaps you may have misjudged your decision making process. Anyway, the point being it is understandable how some auditors may have the knowledge but lack certain other necessary skills required for the job. Should I complain about my FORS audit experience? Ok, so what happens if you encounter said auditor and haven’t had that great FORS audit experience? Well, you need to log a complaint. I know no one wants to sound like a whinge, but it’s vitally important you do log your concern. This way, something will be done about it and it will ultimately minimise the chances of someone else being subject to the same problem. However, you must ensure you do this the correct way. So here’s my list of Do’s and Don’ts after finding yourself in this unfortunate position. Do be polite at all times and stay on good terms. Even if this person is pushing your buttons! Do wait until your audit report comes back before you do any complaining. You need to have all the facts, remember knowledge is power! Do think carefully about how you are going to approach the personality issues encountered. Be as positive as possible. Do refuse an auditor if they are known to be difficult. When allocated an auditor, you do have the right to refuse and request another one. I’m not going to publish any names in this post about the FORS audit experience. However, if you are about to apply for your FORS Bronze audit, then feel free to get in touch and I will happily let know the names to watch out for! *Please note this isn’t to say DVSA visits and DVSA officers provide a bad experience. All DVSA officers whom I have met are very professional and have been very good at making the operator feel at ease. It’s just a more pressured experience as the stakes are much higher! Have you had any bad or indeed great FORS audit experiences? I’d love to hear about them! Let me know in the comments section. Congratulations! Hoban Haulage Ltd pass their FORS Bronze standard audit! This was a new application which Hoban Haulage passed in a record two weeks and what a fantastic achievement and is testament to their commitment to compliance and helping to make London’s roads safer. Hoban Haulage purchased our complete FORS Help package and we worked remotely. They followed the to do list and our advice ensuring a first time pass. A few words from the MD….. If you need any advice or FORS help, then just get in touch. TMconsultant, here to share the knowledge! Link2London Grab Hire pass FORS Bronze standard audit! This was a re-audit for Link2London Grab Hire and what a fantastic achievement and is testament to their commitment to compliance and helping to make London's roads safer. I have worked with Link2London Grab Hire for a number of years now so it was not a problem to ensure they were ready for the audit. I provided my support in the form of the TMconsultant Operator and Driver Handbooks, all the requisite documentation and advice. "I would like to thank Nick from TMconsultant very much for all the hard work and dedication to Link2London Ltd. We just couldn't do this without him!" Thank you Lucian, as always it is a pleasure to work with you. Reis Grab Hire pass FORS Bronze standard audit with ease! A great achievement and is testament to their commitment to compliance and helping to make London’s roads safer. Reis Grab Hire purchased the FORS help documents package with TMconsultant’s assistance passed their FORS Bronze standard audit with no advisories or major action points. We created a to do list based on the information gathered and carried out a catch up once a week to ensure Reis Grab were on track. We were also present during the audit, to further assist our client on the day. We started work on 6th February and the audit took place on 24th March 2017. Many thanks to Sebi, a pleasure to work with you. We are very pleased to announce forklift hire aces, Hiremech pass FORS Bronze audit renewal this month! Although Hiremech passed their initial audit last year, the company has remained focused on improving their transport systems. The review process for the transport department has been ongoing which made preparing for re-application a smooth and easy process. A few words from Brian at Hiremech…. Thank you for your kind words Brian, a pleasure working with you and the Hiremech team. If you need any advice or FORS help, then just get in touch. We’re here to share the knowledge! Big congratulations! Removal and storage specialists Clarks of Amersham pass FORS Bronze standard audit with flying colours in one month! This is a massive achievement and is testament to their compliance commitments. Most of the help was carried out remotely with the assistance of Chiltern Development Training who assisted on site. With a driver training day, telephone and email support prior to the assessment Clarks demonstrated their commitment right from the start. They applied themselves from the outset taking on board all the advice and guidance necessary to pass their FORS audit first time, which took place on 12th January 17. So that’s just over 4 weeks to gain their Bronze award! Many thanks to Michael and the team, it was a pleasure working with you and looking forward to the future. In my post Why We Like Policies and Procedures for Transport Managers I talked about the importance of policies and procedures as they provide the framework for all your transport operations. Today, I want to provide you with some insight as to how to compile your FORS manual the easy way. Thus preparing you for a successful FORS audit. It’s easier that you think! This isn’t to diminish the importance and usefulness of FORS in anyway but once you have your starting point and the requisite components it shouldn’t be too taxing. However, you should give yourself plenty of time as the actual process is time consuming. Follow the rules below and you’ll be on to a winner! I have gained all my experience through helping companies achieve their FORS Bronze accreditation and I know FORS auditors hold the same opinion when they turn up to an audit. Like all humans they prefer to have an easy audit and for that reason they want to see a concise, well written manual containing the correct information which follows FORS Standard. I can not stress how important this is. When you compile your policies and procedures for your audit and follow the Standard you will have completed 80% of your audit requirements. I remember the line “the answer’s in the question” in the Reeves and Mortimer quiz show, Shooting Stars. When first reading through the FORS website it can be minefield of information and broken links and to prepare can be a very daunting prospect. However, the answer is in the question. All the policies and procedures are within the Standard itself. Together with the guidance notes, will provide you with, if not all the information required, certainly most of it. The rest is bespoke company policy you will need to research and compile yourself. Ensure you use the numbering system M1, M2 etc. Use the headers and even the text to compile your document from the Standard and the Guidance notes. If you do this, you will lay the foundations needed to write a great manual. It’s worth noting your drivers will also need a handbook of some description which you can compile in the same way, thus ensuring you have left nothing out. Obviously, you won’t need to include all the Standard for the drivers. Criteria for which will become self evident. Want an even easier solution? If you just don’t have the capacity to compile your own policies and procedures then fret not. I have written both Operator and Driver template handbooks which follow the FORS standard. These tried and tested documents never fail to impress the auditors and I have a 100% pass rate for helping Operators acheive their FORS audit. For more information and to purchase please visit my shop. Thanks for reading my post on how to compile your FORS manual the easy way. If you found this useful please like my Facebook page. If you would like to discus your policies and procedures, Help with FORS or anything Transport Management, please do get in touch. The New FORS Standard update V4 has now been released, along with details of how this affects current members. In this post we’ll have a look at the New FORS Standard update V4. FORS review and update their Standard on a two-yearly cycle and covers the pathways to FORS Bronze, FORS Silver and FORS Gold accreditation. Firstly, who will the New FORS Standard update V4 affect? Organisations registering with FORS after 29 September 2016 will be will be audited against version 4.0 of the FORS Standard. Existing FORS accredited organisations with a renewal date after Wednesday 9 November will be audited against version 4.0 of the FORS Standard. What’s been updated in the new FORS Standard update V4? There have been number of changes as to how some elements and are named and some elements have been swapped around. There’s also been some updates more relevant for the PCV sector and driver training. Here’s a run down of new FORS Standard update V4 changes. New O5 Record Control – This new requirement is now called ‘Vehicle / Equipment Theft and Unauthorised Access’. S5 Driver Training – This section is now called ‘Vulnerable Road User Safety Training’, and now requires any driver training to be FORS approved. Additionally the annual training can now be completed either as an e-learning module or a classroom based session, with at least 90% of drivers having completed (or been booked to complete) the necessary training – I’ll let you know the details on this in the next post. S8 – This section is a new requirement called ‘Road Risk’. There are quite a few changes for the New FORS standard update V4. The great news is they will all be covered in my own updated comprehensive Operator and Driver Handbooks which will be available in the TMconsultant shop soon. I’ll let you know when they’re ready! Even though FORS have updated their website they have, in fact made it even more difficult to navigate!